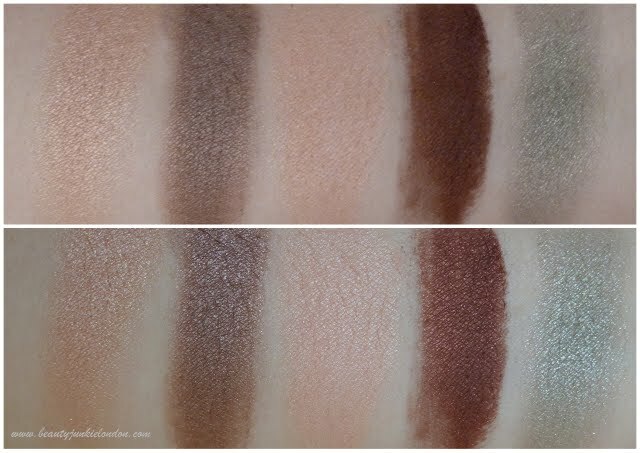 I love eyeshadow, but as this post is going to demonstrate… I’m not wildly adventurous. I know what I like and tend to stick with it. You would think this would make picking favourites really easy, but it’s not. I kinda have to talk about this together because these are my first two MAC eyeshadows and the ones I am repeatedly drawn to whenever I browse a MAC stand, despite owning them both and having back ups. So easy to wear, they go together perfectly. This is one of the new ‘intense’ little round pots from Bourjois. The colour payoff on these is AMAZING! Just one swipe and the picture below shows how intense the colour is. This is actually the slight replacement of one of my other favourites (one of the original Bourjois Little Round Pots, in a warm reddish brown that’s lovely) but I can’t find it and this is a close colour match and even better pigmentation why. Another easy to wear shadow, a pinky shimmer – this is ideal for lazy days where just a quick sweep of colour is all I can be bothered with. It’s quite similar to Naked Lunch, but slightly pinker and less frosty. Seriously, look how pigmented that Bourjois shadow is!? Amazing… plus the new intense pots are more compact and make-up bag friendly. Those marked with a * provided as PR samples, others bought by me. Next Post Benefit ‘They’re Real’ mascara: Flash Sale!